Last year, one of the items I shot ended up being used by a company on their website . Not short thereafter they agreed to sponsor us by buying a wireless audio set for the camera! The deal was a nice one for a local public broadcaster. The company could use our footage, and they would get us some equipment we could really use for creating better videos. The choice fell on the Sennheiser G3 set. 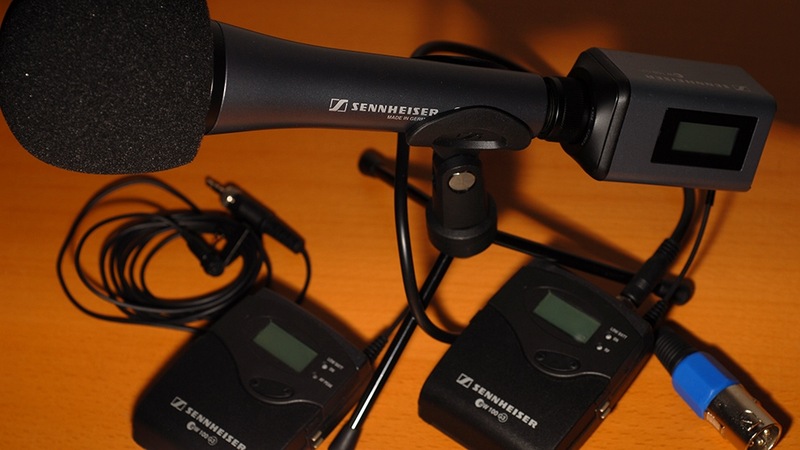 It's basically three parts: a RF receiver that hooks into the XLR port of the camera, A transmitter for use with a Lavelier microphone (or anything else), and a transmitter block for under an interview microphone. So far, I've been able to put the kit to pretty good use. The lavelier mic is good in situations where you have one talky-person walking around. The lav transmitter was also quite convenient when I needed to plug into a PA-system to get the best audio in a situation where a shotgun microphone didn't cut it. And finally, the transmitter block gives an interviewer some much needed freedom of movement. Before, we used a 3 meter XLR cable, but now the interviewer can just do his thing, and I can position my shot however I want. Its truly a very versatile kit, and I can recommend it to anyone who's serious about audio for their ENG video productions.